Sony Effio video processing makes this bullet camera perfect for any outdoor setting. Full size security camera with C/CS lens mount, on-screen display (OSD), and alarm output terminal block. 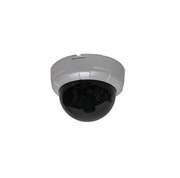 Mighty Mini indoor high resolution dome camera. This full size security camera has an adjustable lens mount so it can accept C mount or CS mount lenses, which makes it incredibly versatile.